There are many ways employers recognize staff contributions, but there are two main divisions between employee recognition styles: top-down, and peer-to-peer. In recognition of an employee's continued contributions to an organization over a number of years, a 'Years of Service' award can be given at specific intervals, or milestones. 'Years of Service' awards do not often involve financial compensation, but may include a gift of some kind. Commonly offered awards include: plaques, engraved pens, or group greeting cards. Employee Appreciation Day is a semi-formal holiday founded by Bob Nelson, a founding board member of Recognition Professional International. Over the past 20 years, other companies have embraced the unofficial holiday, paying homage to their employees on the first Friday of March. Organizations have been known to celebrate Employee Appreciation Day with small company-funded events like barbecues, or small office parties. Additional financial compensation is not often an element of Employee Appreciation Day. An annual bonus is financial compensation given to employees in addition to their base pay. Annual bonuses are given once per year, usually at the end of the fourth business quarter. Annual bonuses can be given for a multitude of reasons, but are usually based on performance, either the performance of the organization, the individual, or both. For example: Emma's sales numbers exceeded her quota for four consecutive business quarters. To recognize her achievements throughout the year, Emma is given an annual bonus in addition to her base salary and commissions. Quarterly bonuses are similar to annual bonuses, but are metered out on a more frequent basis (per business quarter). Quarterly bonuses are most commonly given as part of a heavily performance-based compensation model. Sales organizations are common adopters of the quarterly bonus structure. For example: Alex landed Acme Inc.'s largest customer this quarter. In recognition of that achievement, Alex is given a quarterly bonus at the end of Q2. Many organizations choose to thank workers 'on the spot' for achievements that merit particular notice. These bonuses are generally given in recognition of an employee exhibiting exceptional productivity. Spot bonuses are normally $50 USD or more. They're most often given by a direct manager, an indirect manager, or senior coworker in the organization, but can also be given by coworkers as part of a peer-to-peer recognition program. Their on-the-spot nature dictates that spot bonuses are given at an irregular cadence, in contrast to annual and quarterly bonuses. For example: Fatima's attention to detail and quick thinking saved the company from losing a long-time client. In recognition of her valuable contribution, Fatima is given a $100 spot bonus. Some organizations encourage employees to recognize one another's contributions through the giving of small mementos. Gold stars are a good example of this type of recognition. These stars are sometimes given a tangible value, and can be exchanged for real-life items. For example: Despite an already busy schedule of coding, Javier decides to help out his colleague in the marketing department, who is having trouble implementing a new tool. He earned a gold star from his colleague Allison in return for the impactful assistance he offered. Verbal praise is perhaps the oldest, and longest-standing form of peer-to-peer recognition in the workplace. Verbal praise is given by colleagues, generally in an ad-hoc fashion, in recognition of a staff member's valuable contribution. Although nearly always informal in nature, verbal praise is occasionally solicited as part of a formal staff recognition program. For example: Acme's newest customer was extremely impressed with Esther's timeliness and attention to detail. At the beginning of their sales strategy meeting, Esther's colleagues all congratulated her on the achievement, showing their appreciation for her efforts. Microbonuses are small monetary rewards given frequently by one colleague to another in recognition of a valuable contribution. Although microbonuses can be given by managers to their direct reports, they can also be given by other colleagues, and even from a direct report to a manager. Microbonuses provide several unique benefits. Like spot bonuses, staff recognition in the form of microbonuses can be given in the very moment that a valuable contribution is made by an employee. Employee recognition given in the moment has the greatest potential for impact, because the action is rewarded almost immediately, when it is top-of-mind. Because microbonuses are small by nature, they can be given often, providing multiple positive instances of employee recognition without dramatically altering an employee's compensation. For example: Jeremy's new update to the company's landing page improved conversion by 60 percent, and brought in three new signups in one day. Jeremy's colleague Elisa gave him a microbonus because those new signups became part of her sales pipeline. Although spot bonuses have traditionally been given by managers as part of a top-down employee recognition program, they can also be given as part of a peer-to-peer recognition program. 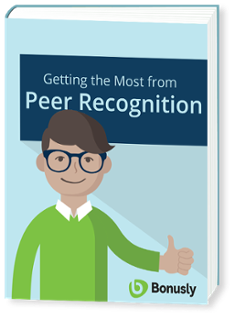 Learn best practices, tips and tricks to get the most from peer recognition. Read next How Do I Build a Successful Recognition Program?